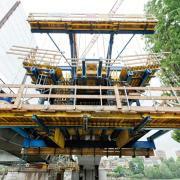 Two Doka cantilever forming travellers (CFTs) have been fielded for building a new bridge over the Rhine in Basle. The piers are set at a slight angle to the river, necessitating oblique construction joints in the transverse direction of the bridge. Despite this challenge, fast forming-times are being achieved. The connecting line between the city’s ‘Basel SBB’ and ‘Badischer Bahnhof’ railway stations is being given a second twin track. The principle structure of this upgrade project is a new, second bridge over the Rhine, with a 117 m centre span and an overall length of 237 m. This is being built parallel to both the existing railway bridge and to a motorway viaduct. The oblique construction joints in the transverse direction of this railway bridge presented a particular challenge in terms of the forming operations. 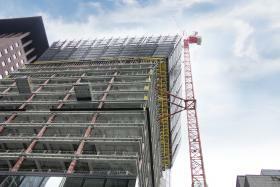 The contractors Frutiger AG and Walo Bertschinger AG were completely convinced by the high safety standards and efficiency of the systems now in use at this site, and so opted for the formwork solution proposed by Doka. 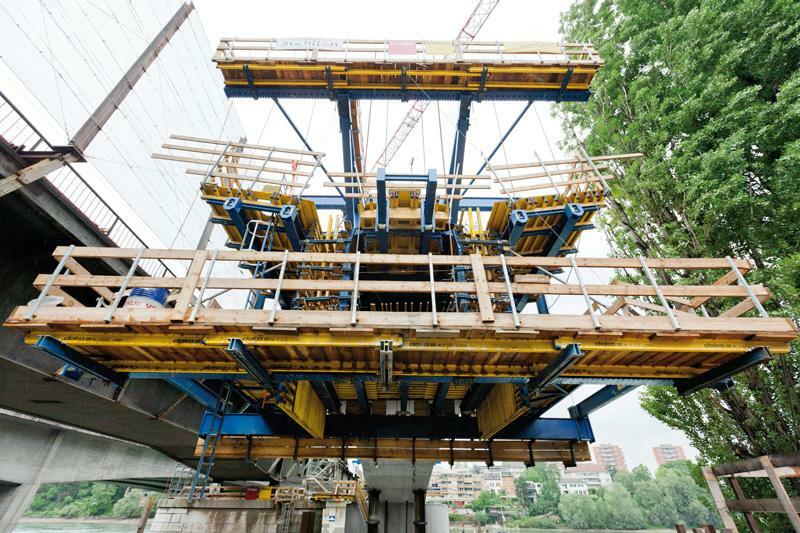 An 8-man crew is forming the new Rhine bridge using two cantilever forming travellers, having been helped by a Doka Formwork Instructor to get the forming operations up to speed. 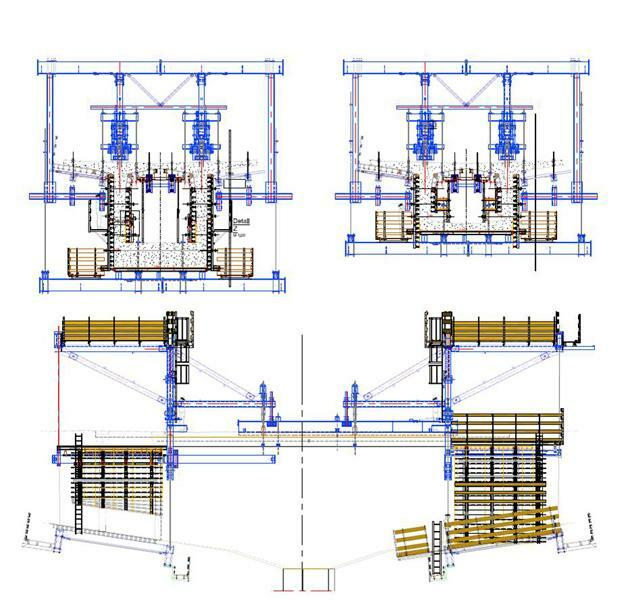 The modular design concept of the Doka CFT, based on rentable standard components, and its high level of workplace-ergonomic design together allow rapid construction progress with no time-wasting, costly downtimes. In most cases, the construction joint will be at a 90° angle to the deck slab, with a 3 m to 5 m long segment being cast on the CFT’s cantilevering shoring structure and formwork in a weekly cycle before the CFT is advanced to the next casting segment. However, for this railway bridge over the Rhine in Basle, the project engineers designed the piers to basically follow the direction of the Rhine while standing at a slight angle to the bridge deck. 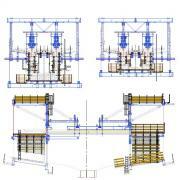 This results in oblique construction joints in the box-girder of the bridge. The 3 m and 3.9 m lengths of the casting sections were also an unalterable parameter. The challenge for the Formwork Experts was now to arrange the hole-grids of the two launching rails of each CFT at an offset to one another in each of the 56 segments, in such a way that the construction joint can be formed at an oblique angle yet while permitting smooth pouring and rebar placement. The CFT itself can only be erected at 90° to the deck slab. Thanks to the exact alignment of the hole-grid of the launching rails, the crew are making a success of this architecturally challenging construction method. The Doka cantilever forming traveller (CFT) has special slide bearings which enable it to be travelled in a safe and controllable way. The site crew are kept safe by fully railed-in working platforms on all levels, during all phases of the work. Integral caged ladderways, and the safety mechanism which self-locks the CFT while it is being advanced on sliding plates, are further quality features of this CE-certified product. Thank you for your interest - Fast cycle times despite oblique-angled joins. Thank you very much for your interest - Fast cycle times despite oblique-angled joins.